Nobody likes getting complaints from customers. Especially when they’re aired on a public forum, like your social media accounts. And if there’s one thing that you can expect to receive on your business social media accounts, it’s complaints. Not all of them will be genuine, or even true, but when they happen you need to take action. Luckily, there are ways to make customer complaints work for you, rather than against you. It’s all too easy – especially when it’s your own business – to take the complaints personally. You’ll miss an opportunity to develop your business. It’s the third point that I want to focus on, because this is the part most often missed. 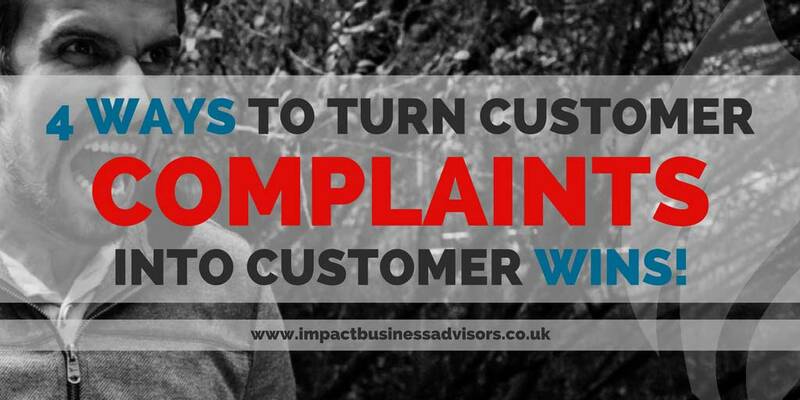 Here’s how you can use customer complaints to develop your business. As great as it is to get brilliant reviews and great feedback, they don’t help you identify areas of your business that could be improved. And this sort of opportunity is incredibly valuable. Of course, not all complaints are valid, justified, or even true. But those that are represent absolute gold for your business development. Look for common patterns across complaints – if several customers are experiencing the same issues, then it’s probably an area of your business that needs attention. Even in isolated cases, there are lessons to be learnt. Try and approach each complaint with this in mind – and remember, complaints are more valuable than compliments. This can be particularly difficult. When I say “dispassionate”, I don’t mean that you should act as if the complaint isn’t a big deal. Rather, I mean that you should distance your personal feelings from the issue. It’s not a personal attack. It’s a customer who hasn’t had their expectations met. So – look at each situation from the customer’s perspective AND your own. What could you have done differently to avoid this outcome? What should have happened, but didn’t? And how can you put this right – not just in this case, but to avoid this happening again? It’s important, in customer service, to maintain an open and honest dialogue with the customer. It needs to be easy for them to get in touch with you. And the quicker you can respond to them, the better. Being in regular contact with the complainant not only helps defuse the situation, but also presents an opportunity for you to pick up on those points for improvement for your business. Be open with them, and ask questions to show that (a) you are taking their situation seriously, but also (b) that you are picking up on all the learning opportunities from the situation. This is often forgotten, but can be the most powerful way to convert a complaint into a loyal customer. Once you’ve solved the customer’s issue, identified learning opportunities, and acted upon them to improve your business – then, go back to the customer and tell them how you’ve improved, and thank them for bringing the issues to your attention. This can mend a previously broken relationship. It can re-emphasise that you took the customer’s complaint seriously. And it shows the customer that they’re valued. And THAT builds loyalty more than anything else. Want a FREE Digital Marketing one-on-one workshop?